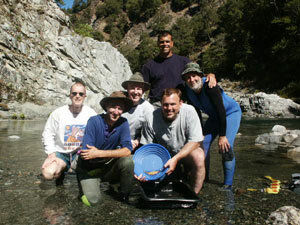 » High Grade Gold on the Salmon River! This project was made up of a smaller group than normal. Four participants arrived on Saturday morning. A fifth person arrived later in the week. Since it was going to be a smaller group than normal, my two helpers (Craig Colt and Shawn Higbee) and I had made a plan to use one of the Club’s large commercial rafts to get us all into the deep canyon along the Klamath River just downstream from Happy Camp. I have always had a good feeling about this section of the Klamath. As the area is somewhat inaccessible, few people have been down there with dredges. We spent some time sampling down there earlier in the summer during a group prospecting project above the water. While we were sampling the banks down there, I took the opportunity to swim some of the river with mask and snorkel. The area looks good, with lots of exposed, rough and irregular bedrock showing along the river-bottom. There are lots of faster-water areas there where the pay-streaks should not be buried under very much overburden. I’m thinking there will be high-grade gold there that is not too difficult to find. But a few days before this last project was to begin, while Craig and Shawn were busy getting all the dredging gear and the raft ready, the water-release from the Iron Gate dam (upriver) was increased, raising water levels about a foot, and turning the river a green color. Underwater visibility was down to about two feet at the surface. It would only be about half that on the bottom of the river. This created very poor conditions to be trying to coordinate a group mining program – especially under faster-water conditions. One look at the river prompted me to direct Craig and Shawn to put the raft back into storage. We needed to find another place to go. From earlier communication with the group (they all flew out together from Chicago to do this project), I knew they preferred to dredge in a river, rather than on a creek. That left me comparing our Scott and Salmon River opportunities. Both were running with crystal clear water. While I was trying to decide where to do the project, Dale Carnagy stopped by the office to show me a whole bunch of very nice gold he and Jason Inks had just dredged together a few days before down on the Salmon River. These are two long-time members of the Club who have spent most of this summer dredging along the Main Stem of the Salmon River. Jason was working a pretty good pay-streak further upstream, while Dale just made a very high-grade strike at the lower end of the claim. Dale’s best day working alone, so far, was about three ounces of nice flakes and nuggets. It was really nice stuff! Dale told me Jason had gone off to get a winch, because the boulders were really slowing them down. They decided to work this high-grade deposit side-by-side, helping each other with the boulders. It did not occur to me until after Dale left the office that I should have asked him if they might like to have 5 more partners for about a week, to help them get their high-grade pay-streak opened up. I gathered that they did not have much winching experience, and (I was hoping) the support of an organized project might just be the thing they could use at the moment. The following day was the day before the group would arrive from Chicago to begin the project. I needed to decide where we would go. Just as I was about to drive down to the Salmon River to make a proposal to Dale and Jason, they both arrived back in my office to show me even more gold they had dredged. It looked really good! Nice nuggets!! The great thing was that Dale and Jason did not even hesitate to offer up their rich pay-streak to help out the Club in a week-long project. While they would benefit from gaining exposure to a more commercial approach to opening up a hole filled with boulders, I am certain their primary motivation was to do something good for the Club. This saved us a lot of time, because it meant that we could use the two 5-inch dredges and 8,000-pound electric winch that Dale and Jason had already brought into the lower canyon area. As soon as the project-group arrived on Saturday morning, we checked out everyone’s personal gear to make sure everyone had what they would need. Then we drove down to have a first-hand look at the project site where Dale and Jason were dredging along the Salmon River. This was down in a pretty deep canyon area. But there was already a trail leading in, so it was not bad access in comparison to how bad it might have been. I wanted to make sure all the guys were up for making the hike in every day, and that the group was comfortable about our taking control over an existing successful project that was started by other members. We were going to be dredging in someone else’s rich pay-streak. That doesn’t happen very often. It was important, before getting started, to make sure that everyone was alright with that. After some discussion down on the site, we all agreed together that we would form up a team that would allow me to manage the project for a week. We would evenly split the gold recovered during the week amongst all the participants, and then turn the pay-streak back over to Dale and Jason. We were all pretty jazzed-up! Dale and Jason had already dredged several sample holes in this section of the Salmon River while trying to establish the size of the pay-streak. The holes were of various depths, some going all the way to bedrock, and some which were blocked by rocks that were too large to roll out of the dredge holes. There were big rocks in every hole. It was clear to me right from the beginning that an organized winching operation was going to be the primary key to progress and success in this project. So we all spent Saturday afternoon throwing rocks to build-up a small island in the middle of the river downstream of the dredges, and using cables to anchor the electric winch (on the island) to a large boulder further downstream. We pulled the first big rock out of the dredge hole before calling it a day, to make certain that the winch was set up properly. It was. 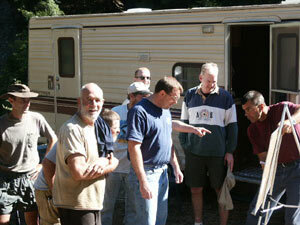 Sunday morning was devoted to moving our camp down to the mining claim. This was going to save us three hours of driving back and forth to Happy Camp every day. Several of us stayed down there for the remainder of the project. Salmon River country is some of the nicest area on this planet. It is a great place to camp! Sunday afternoon found us making two journeys down into the canyon, hauling in our personal dive gear, and some special rigging to make the slinging of boulders go more quickly when winching. We connected 5 HOOKA airlines to the two 5-inch dredges. 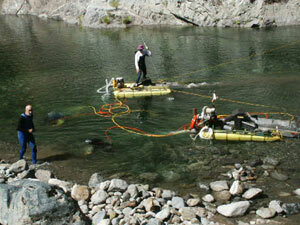 The plan was to have two people work each dredge, and one person sling boulders and get them out of the hole. We decided to drop back and start a new hole, not far behind where Dale had dredged his 3-ounce day just a few days before. 1) I must help less-experienced participants through the early stages of their underwater learning curve as soon as possible, so they can participate in accomplishment of the other two objectives. Sometimes beginners arrive with some fear of going underwater the first time. But we always get through it. 2) We must find a pay-streak. This normally requires all of the participants to perform the necessary steps to complete a sampling plan in the section of the river that we have chosen. Sometimes the sampling phase takes two or three days. The idea is to try and find something rich enough to get everyone excited, and provide us with enough gold to split up at the end of the week. 3) Once the pay-streak is located, we pull ourselves together as a production-team to recover as much gold as possible in the remaining time allowed to us. This is always the best part. All of the participants in this project had past HOOKA or SCUBA experience, so the first objective was already accomplished before we even started. Because Dale and Jason had already located this pay-streak, all we had to really focus on from the beginning was organizing ourselves for optimum production under the circumstances. While we were certainly going to work hard, and the boulders were going to require a structured approach, not having to worry about the first two objectives was going to make this project more like a vacation to me. This was a good way to finish my season! Dale and Jason had already established that the gold was coming off the bedrock and out of a 4-foot-thick, yellow layer of streambed material lying on top of the bedrock. We found the yellow layer shortly after getting started, and the guys immediately started seeing large flakes of gold here and there in the material. This pay-streak was different than most others I have seen. Usually, high-grade gold accumulates either on the bedrock, or in the contact-zone between two different layers of streambed material. Here, the gold was widely disbursed throughout the yellow streambed material, and did not seem to be any more concentrated at any particular level. I’ve occasionally seen this in some original streambed layers on the Klamath River, too. There was definitely a greater concentration of gold along the bedrock. 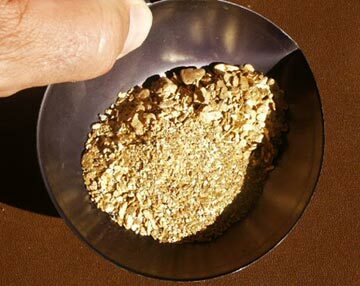 Almost all the gold we were finding consisted of large flakes and small nuggets. requires some planning in advance, a good and fast communication system with the winch operator, and a lot of intention to make the boulder go where you want it to. You have to make your winching system bigger and stronger than the boulders. Otherwise they start running around wherever they want to go, increase the danger to people and gear, and eat up a lot of precious time. While having a strong winch is definitely important, the main keys to a smooth winching program are leaving yourself a smooth runway (so you are not trying to pull a boulder past some big obstruction that is directly in the way), and re-slinging the boulders as often as necessary to keep them from slipping free and rolling back down into the dredge hole. Keene sells a really good cable rock-net for winching. But to get the most out of Keene’s rock net, you must also have a 4-point harness made up so that the net can be attached to the pull-line of your winch. Then, slinging is mostly a matter of draping the net around the back-side of the boulder and giving the pull signal to the winch operator. We pulled boulders out of the dredge hole non-stop on Sunday afternoon, not touching down on bedrock yet, even though we were about six feet deep into the yellow streambed material. The excavation was getting pretty big. This was necessary, because it was important to not leave any loose boulders resting up on the face of the hole that could roll in on any of the divers. So the deeper we went, the wider we had to make the hole. This is normal. 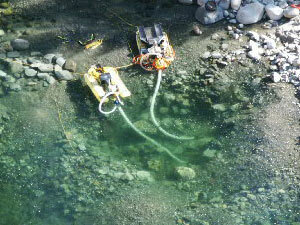 Between the two dredges, we estimated that we recovered around 1 ounce of nice gold flakes during the first day of work. We figured we would do even better once we established ourselves on bedrock. 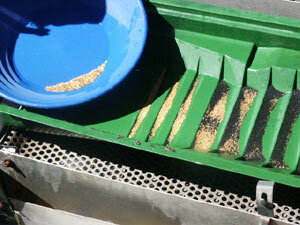 We do not do a full and final clean-up of gold at the end of the day on any serious dredging program. It takes too long, and would subtract valuable time from the productive activity in the dredge hole. However, we do clean the high-grade portion of the concentrates out of the dredges each day and make a pretty close estimate of how much gold we recovered. This is important to both planning and morale. By comparing how much gold we are getting to what we are doing, and where, we can focus the following day’s effort towards what seems to be most productive. Seeing the gold also gets everyone pretty excited! As we do on every day of these group projects, the following morning found us planning our day’s activity over a chalkboard at camp. This is the time to talk about everything we are doing, cover all the reasons why, debate ideas on how we might do it better, and finally decide upon a team-plan for the day. We spent considerable time each morning on this project talking about winching procedures, signals and the need for the underwater person and winch operator to establish communication and an organized system to make the process go quickly, smoothly and safely. There was also a lot of discussion about how to excavate a deeper dredge hole safely, in a way that kept the richest pay-dirt (down along the bedrock) from getting covered up with boulders or cobbles by the time we got down to it. Since bedrock in this hole was deeper than we anticipated, we decided to initially spread our hole in the direction of the streambank where there was visible bedrock showing along the edge of the river. Establishing some bedrock along the bottom of a dredge hole is the first major objective in getting a production operation underway. We were eager to make that happen. Finally, towards the end of the day on Monday, we had some bedrock showing on the side of the hole that was closest to the bank. We were seeing some pretty nice gold on the bedrock, too. By now, we had winched around 50 boulders out of the excavation, and it was really getting opened up. But we were getting slowed down by some very big rocks that were going to be too large to winch out of the hole. While we could use the winch to roll them into the hole, we did not want to move them in until we had a chance to get the gold off the bedrock where the huge rocks would eventually end up. This forced us to slow down so we could do things safely. We estimated about another ounce of flakes and small nuggets were recovered by the two dredges on Monday. The hole was opened up to make some pretty good progress on the following day. The key to the best progress in a streambed that has lots of boulders is to look ahead of yourself and decide where things are going to need to go. My experience has been that it is best to initially winch every possible rock out of the hole. Once some bedrock is established, don’t allow it to immediately get all covered up by new boulders. Winch them out, too. You have to make some room in advance for the really big ones that can only be rolled once. This is where we found ourselves on Tuesday morning; rolling the really big ones to the rear of the dredge hole, where we had left room for them the day before. Rolling the big ones out of the way opened up our hole nicely, and allowed us to establish bedrock all across our dredge hole. Some of the rough and irregular bedrock was giving up a lot of gold flakes. We connected up an air-powered chisel and were pulling nice gold out of cracks as deep as we could break them open. By now, the hole was large and safe. We pulled around 3 ounces of nice gold on Tuesday. Now things were beginning to get pretty exciting for everyone. By now, we estimated that we had accumulated around 5 ounces of gold in getting the hole opened up. During our planning meeting on Wednesday morning, based upon our production from the day before, we made a target to recover 6 ounces of gold for the day. Everyone agreed that this was something we could accomplish; and it would place us well ahead of our weekly target of 12 ounces. But then we had a turn of bad luck on Wednesday morning, when our dredge hole pushed right up into an old dredge hole that someone else had worked years before. Here, the hard-packed yellow streambed material turned to loose cobbles, boulders and sand. 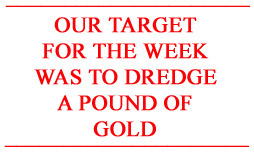 This was a pretty heavy blow to our morale, and completely undermined our gold-target for the day (and the week). We found ourselves in a meeting up on the stream bank trying to figure out what to do next. While it was a great learning-experience for all of the participants to see what previously-dredged material looks like at the bottom of the river, all of us were feeling the weight of how much effort it was going to take to begin another dredge hole from the beginning in all those big rocks. But it was really the only thing we could do. After cleaning up the small portions of yellow-pack to recover the last of the gold that remained in our original hole along the bedrock, we moved the dredges forward and repositioned the winch to open up an entirely new dredge hole. We decided as a group that even if we could not finish the new hole, we could at least add more gold to what we would split off, and leave Dale and Jason with an excavation in the yellow-pack that they could develop into a production program for themselves after we left. The new excavation was pretty-much a repeat of the first. By Thursday afternoon, we had winched another 40 or more boulders, and had touched down on bedrock again in several places. We recovered another ounce or so of nice gold. And we left Dale and Jason with a production-hole that they could further develop on their own into something very valuable. The group from Chicago needed to fly their airplane back home on Saturday. So we all decided that Friday should be spent on getting personal gear back out of the canyon, and performing all of the final clean-up steps on the gold we had recovered for the week and split it all up. This took all day. For the week, we ended up with just short of 7 ounces of gold, which included 3 ounces of nice nuggets. This amounted to about an ounce for each of the 7 participants. Everyone was happy. Although it is very important, we learned early on that the amount of gold we recover on these projects is not the only measurement of success. Participants gain valuable experience, giving them an improved ability to find more gold on their own afterwards. There is the excitement and adventure of the project. And each successful project improves our perception of where more valuable high-grade gold deposits lie waiting. There are fantastic feelings of excitement that come from locating a high-grade golden pay-streak of Mother Nature’s treasure! Had we not run smack up into some earlier dredge hole, I’m certain we would have surpassed our target of recovering a pound of gold on this project. But that’s the way it goes. We’ll shoot again for the 1-pound target in next year’s group projects. As it was, we all were feeling pretty happy about the way the week turned out. We also have a much better idea of what we are looking for to find the underwater high-grade gold deposits on the Salmon River! It is members like Dale and Jason that make The New 49’ers a truly great group to be associated with. Once again, I find myself counting my blessings.